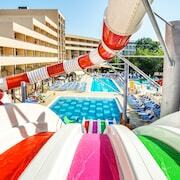 This family-friendly Sunny Beach hotel is steps from Casino Hrizantema and Sunny Beach. Action Aquapark and Aqua Paradise are also within 3 mi (5 km). Where to find Sunny Beach hotels near an airport? Where can I find hotels in Sunny Beach that are near tourist attractions? If you are wondering where to base yourself in or near Sunny Beach, you will find an extensive range of suitable possibilities. Expedia features 124 hotels and other accommodation options within a 0.1-kilometre (0.06-mile) distance of central Sunny Beach. Canny vacationers who fully appreciate the convenience of finding a hotel close to the action will love the Iberostar Sunny Beach Resort - All Inclusive and Hotel Juli, which are located within a 1-kilometre (0.6-mile) radius of Sunny Beach's downtown. The Sunny Beach area features a solid selection of lower-priced accommodation options sure to delight even the thriftiest vacationers and travelers. 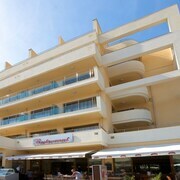 0.1 kilometres (0.1 miles) away from Sunny Beach's downtown you'll find the Diamond Hotel-All inclusive. The Amphibia Beach Complex is only 3 kilometres (2 miles) away. Some more options in the lower price range include the Victoria Palace Hotel and the Holiday Fort Golf Club. The Sol Nessebar Mare is positioned 5 kilometres (3 miles) from the central part of Sunny Beach. Alternatively, the Sol Luna Bay Resort - All Inclusive is situated 20 kilometres (13 miles) away. 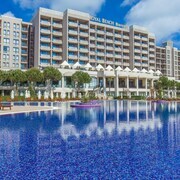 Some other Expedia-listed hotels are the Sol Nessebar Palace - All Inclusive and the Primoretz Grand Hotel & SPA. Looking for more to do? Why not spend a few hours enjoying Sea Gardens and Burgas Beach, in Bourgas, 30 kilometres (18 miles) to the southwest of Sunny Beach. 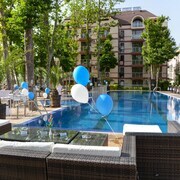 Some of our recommended Bourgas hotels are the Hotel Bulgaria Burgas and Hotel Burgas. Or stay in Tsarevo, 60 kilometres (38 miles) to the south of Sunny Beach, where you'll find the Oasis Resort & Spa and Primea Boutique Hotel. The Georgi Kondolov Cultural Center and Church of Sveti Tsar Boris-Mikhail are just some of the more popular points of interest to check out when you're in Tsarevo. If you are really into sports and really like games you might like to make a trip to Ticha Stadium, which is 60 kilometres (38 miles) to the north of Sunny Beach. Book accommodation nearby to the action at the Dallas Residence or the Graffit Gallery Hotel. Burgas Airport is a convenient airport for flying into Sunny Beach. It is 20 kilometres (13 miles) away. If you plan to stay nearby, try the The Clara Aparthotel & Residence or Atlantis Resort & SPA. What are the most popular Sunny Beach hotels? Are there hotels in other cities near Sunny Beach? What other types of accommodations are available in Sunny Beach? Explore Sunny Beach with Expedia.ca’s Travel Guides to find the best flights, cars, holiday packages and more!